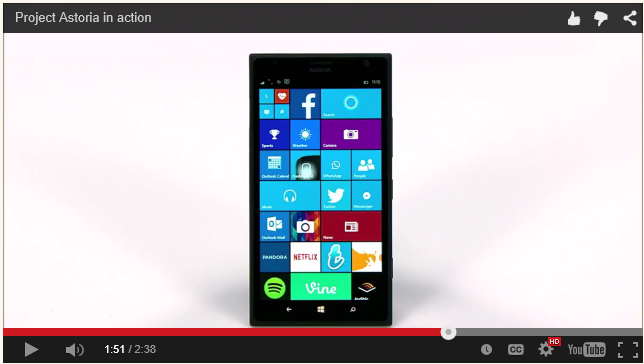 Anyone notice 8 column start screen in Project Astoria video from MS? Nice spot, looks like a 930/icon too, so not a huge screen size. EDIT: Looking again the corners aren't rounded enough to be a 930. 4 columns. Should look good on phablet sized screens. I think it's going to be good on 5" too, maybe smaller. On my 920's 720p screen, the gap is currently 19 pixels between tiles and a 21 pixel border around the tile area to the edge of the screen. Across the screen, that's 137 pixels of empty space across 6 mini squares. Once that gap is reduced, you don't have to scale down the tiles all that much to fit the new grid. noersetiawan and James8561 like this. Ma Rio, TechFreak1, MaxyBley and 3 others like this. Definetly a 1520... see the size of those buttons. It's easy to fall for it. I did also. Took me a few seconds to figure out what was happening. Guessing you meant 8 Rows? No, columns. It'll make 14 rows of the smallest square, and 8 columns. Ah right, you meant 8 columns with small tiles, my bad. I did. Thought, it 'd be a concept.. Exactly, people seem to get confused between columns and rows. I remember when WP 8.1 was shown off with the third column (based on medium tile size) and people were stating it had a third row of tiles!!! Saw this in another video where they demoed continuum. Looks pretty good. Can't wait till windows 10 drops. Off topic: How I wish Microsoft would put swipe keyboard in Windows 10 tablet mode. The closer tile arrangement is starting to look a bit better. In that screenshot it's looking more like 'classic' WP (something I really hope Microsoft doesn't leave behind). The 4-column arrangement isn't something I'd use on my 1020, the 3-column layout is just the right size, but I imagine this would be useful for phablet owners. This kind of start screen layout (4 medium tiles per row, less space between tiles) can be seen in a number of demos and slides from build. Seems like they want to make better use of the screen real estate on phones. I guess that this specific layout will be available on larger phones only, but maybe the smaller ones will have the narrow spaces between tiles as well (but only 3 medium tiles per row). I wonder if the desktop version of Windows 10 will have that as well, so far we haven't seen this new layout on the desktop. Considering that Belfiore described the demoed start menu on desktop as near-final, I don't think it will change much. Keep in mind that the start screen on phones is probably still more of a work in progress than the desktop start menu. For example, the tile grouping feature that is available on the desktop is not implemented yet (it was included in all of the official mockups we have seen so far). 1520 has camera on left side. 930/icon/830 have on the right side but also have a Nokia logo to the right of the camera. There's also no sensor on the left. It seems like something else. My bros 925 has a left side camera and a sensor on the right, but doesn't look like that for sure. No idea what that is. As I said earlier, on the current TP build, on my Lumia 920 there's a 21-pixel gap all around the tiled area to the edge of the screen and there's 19-pixel gap between tiles. On a 6-column layout, that means the gaps are 21+19+19+19+19+19+21 = 137 pixels out of 768, which is huge. As you can see, the difference between the size of the old small square tile and the new one is very small indeed. If I had made the gutter around the edge smaller and/or used a 3- or 4-pixel gap between tiles, the new tiles would have been a touch bigger and thus the difference would be a touch smaller again. I think any phone that is currently displaying a 6-column layout now ought to be able to handle an 8-column one without any problems at all. Last edited by DCTF; 05-04-2015 at 01:10 PM. This is pretty cool. Would work on screen sizes with 5" or more. My 1320 has it in 10080 but now I rolled back to 8.1 so goodbye 4 rows! Yep my 1520 has it too. Pretty nice but it'll be ever nicer when Start and tiles get cleaned up. I think devices with 4.3" or more should also have this 4 row tiles. Explorer in Windows 10 has two different Desktop nodes? Why is scrolling not working in some pages of IE 11? Going back to 8.1 from WP10 - Will my SD card be reformatted?